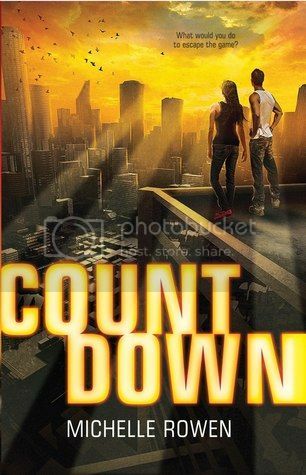 I was super excited to get my hands on Countdown, as I’m really enjoying dystopia novels at the moment, and the book sounded great! This book definitely did not disappoint! Countdown is a super-secret reality TV show where contestants race the countdown in order to win the game and stay alive. The secret part of this show is that it is viewed by a very select audience of people, people that enjoy the brutality that comes with this dangerous game. There are only two options for the game; you win and choose whatever you want for your prize, or you lose and then you die. The main characters in this story were so awesome. Kira had been on her own for the past two years, after her family was brutally murdered. So naturally, she trusted no one, which was totally understandable. After waking to find herself alone in a dark room with the mysterious Rogan, she has to learn to trust him in order to stay alive. I really enjoyed watching these two characters learn to trust each other, not an easy feat considering both of their mysterious pasts. Both of these characters were strong willed and determined to survive and win the game. This book definitely starts off with a bang. It’s full of action and is extremely fast paced. It has been a long time since a book has kept me on the edge of my seat the way Countdown did. I thought the storyline was very creative as well, and even realistic. This is something that I could see happening in our world, and it would definitely not be something pleasant to watch. Overall, I enjoyed this book SO much! I would absolutely love to see a sequel for this book so that I could see what exactly happens to Kira and Rogan in their new lives. If you enjoy dystopian type books, this book will definitely be right up your alley. Check it out! I didn't know this book but I'm definitely gonna check it out because it seems awesome! Sounds like the tension in this one was great! I love that it kept you really thinking and on the edge of your seat, Christy. I've been meaning to try something by this author for some time, so hopefully I'll get to read this one or one of her others soon.